Pilar talks to Andrea Darabos and Ryan Behrman form the London Management 3.0 Meetup Group. 00:10 Pilar recommends some podcasts. 09:55 Why they set up the meet ups. Link to meet up. Their favourite meetups. How the Meetups have evolved and the different formats they take. 21:10 Advice for people who want to start a Meetup. Meetups in other cities when you're traveling. 30:45 Agile moving into the mainstream. Using agile terminology with a range of teams. 36:50 Their own companies, their philosophy and why they set them up. 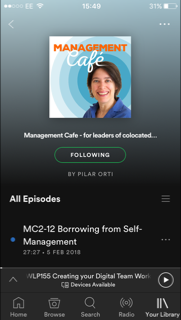 42:50 How do you become a Management 3.0 facilitator? If you want to listen to the interview with Jurgen Appelo, listen to Episode 4 of the 21st Century Work Life podcast. Join the Management 3.0 London Meetup!